Fight for single-payer exposes divide between the nation's nurses and doctors. California Democrats had a harsh message for the group of nurses who crashed their annual convention last week and chanted demands for a single-payer health care program. In fact, electing new Democrats is exactly what the nurses had in mind. “They cannot be in denial anymore that this is a movement that can primary them,” RoseAnn DeMoro, head of the California Nurses Association, told the crowd of protesters before they stormed the convention. Despite Burton’s suggestion, the nurses are already thinking beyond just parades and protests. 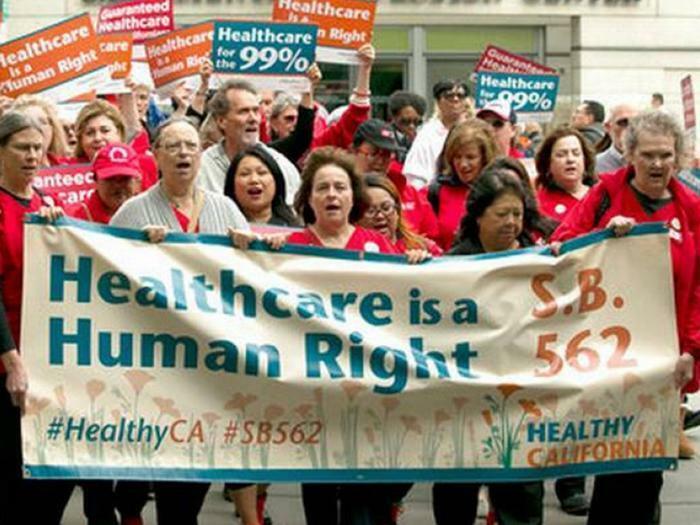 The California Nurses Association, the largest group representing the state’s nurses, is co-sponsoring a bill with two state senators that promises to bring a universal, single-payer health care program to the entire state. Under SB562, all Californians’ existing insurance plans, whether they are employer-based or public, would be replaced by a government-run program. A report recently released by the California state budget office says that existing taxpayer funding would help pay for universal coverage if the bill passes. But additional taxes, such as a 15 percent payroll tax on income, may be necessary to cover the rest. Opponents note that Californians could foot the bill in the form of taxes ranging between $100 to $212 a month to fund the estimated $400 billion program. Supporters however point out that health care currently costs Californians an estimated $367 billion. And they say that consumers will save money when they no longer are on the hook for monthly health insurance premiums, co-pays, or deductibles. Previous studies by the Kaiser Family Health Foundation show that the cost of health care in California has grown vastly higher than the cost of wages, a trend that is similar in the rest of the country. “Over the past 16 years, workers have had to contribute 221 percent more toward their employer-sponsored premiums, while premiums have increased 203 percent and wages and inflation have lagged far behind,” writes Dr. Paul Young, a California doctor and board member on Physicians for a National Health Program, a left-leaning doctors’ group that has long pushed for single-payer health care. While the California Democratic Party leadership has been outspoken about coverage gaps in Republican health care proposals, they have stopped short of endorsing a Medicare-for-all type program in their home state. The war of words at the convention, as many noted, showed a rift developing between different factions of the Democratic Party. But the fight over SB562 also exposes a rift in the medical community. In the California battle and elsewhere, nurses have advocated for a vastly different health care system than what Americans currently have. The American Nurses Association “believes that health care is a basic human right,” the group said in 2009. “The United States is the only industrialized country that does not explicitly express a commitment to its people to take care of at least their basic health needs,” they continued, well before politicians like Senator Bernie Sanders popularized that talking point. But those views are not shared by the nation's leading, mainstream doctors' group. The California Medical Association, the state group representing 43,000 doctors from various specialties, has declined to endorse SB562. In a statement, CMA spokesman Joanne Adams suggests that her association would support a single-payer health care in at some point, but not in the bill's current form. “CMA has policy supporting a single payer system provided it meets certain benchmarks -- the most important of which is demonstrating that the legislation would make appropriate investments in health care infrastructure including providers for Medi-Cal and private insurance holders,” Adams writes to ConsumerAffairs. Adams says that the medical association is “not confident that the state is currently prepared to commit sufficient investments towards meaningful access to care. Access is a hollow talking point when patients can't get a doctor's appointment or afford the bill." In the absence of a single-payer program, the nurses have supported a public option, which Barack Obama and other Democrats had proposed as a compromise between private insurance plans and government-run health care. The public option would have allowed the government to introduce its own, publicly-financed plan to compete with private insurance plans. But a stern warning at that same period from the American Medical Association, the country’s largest and most powerful physicians’ group, drew much more attention. “The introduction of a new public plan threatens to restrict patient choice,” the AMA wrote in a letter to Congress in June 2009. Before then, the AMA had been staying out of the health care debate and refused to endorse any of the reforms being discussed. The following month, after the public option idea was gutted, the AMA did finally endorse Obamacare, getting rid of a substantial hurdle to allow for the bill’s passage. It was a rare break from tradition. As the New Yorker reported last year, the AMA has historically been slow to welcome any change to whatever the existing health care structure is in place. The AMA, for its part, wrote in their mission statement last year that they have “long advocated for health insurance coverage for all Americans.” And the AMA more recently has been highly outspoken and critical of the GOP’s health care plan, expressing concern for the millions of Americans who would likely find insurance to be unaffordable or lose Medicaid coverage under the proposal. In their own mission statement describing a better health care system, the AMA says that Americans should be allowed to stay on their parents’ health plans until they turn 28 and that no one should face penalties for existing conditions. They propose giving drug companies incentives to lower their prices and providing tax credits for consumers with low incomes. If New York State is any indication, the fight to bring government-subsidized, universal health care to California will not be easy. Last week the New York State Assembly passed their own so-called “Medicare-for-all” act, a proposal that would similarly eliminate premiums, deductibles and co-pays and instead use tax money to provide residents universal coverage. But the bill was originally proposed by Assembly Member Richard Gottfried back in 1992, and has passed in that same chamber three times since, as the Village Voice reported. Whether it can pass the state senate remains to be seen. In the absence of support from the American Medical Association, a wave of smaller, specialized groups representing doctors and health care workers have instead publicly endorsed single-payer health care plans. Groups representing some of New York State’s interns, residents, family physicians and pediatricians are listed as supporters of Gottfried’s New York Health Act, while California’s SB562 campaign touts support from the American Association of Community Psychiatrists, California Health Professionals Student Alliance, the National Association of Social Workers and the California Physicians’ Alliance.